In 2015, the National Air Filtration Association (NAFA) Foundation funded a research proposal by Associate Professor Michael Waring at Drexel University, which was to determine whether high-efficiency filters could be used to effectively control indoor particulate matter (PM) at high ventilation rates in offices. This executive summary outlines some of the key outcomes of that study. This study is important for protecting human health because exposure to high concentrations of PM has been correlated with higher prevalence of acute and chronic cardiopulmonary diseases and even, in some cases, mortality. Even though indoor PM is mostly generated outdoors, people spend 90% of their time in buildings and so tend to have higher exposure to it indoors. PM is largely brought indoors through building ventilation systems, wherein outdoor air is deliberately brought indoors. Ventilation’s purpose is to improve indoor air quality (IAQ) by removing odorants and harmful pollutants that were generated indoors. Additionally, newer studies show the advantages that higher ventilation rates have on improving occupant productivity and wellbeing in general. However, these higher ventilation rates amplify the concentrations of indoor PM coming from outdoors, and thus also PM exposure public health outcomes. Filters in air handling units remove PM from ventilation airstreams and are therefore used in many buildings to mitigate indoor PM concentrations. In the United States, standards set by ASHRAE require the use of filters with a Minimum Efficiency Removal Value of MERV 8 at a minimum. Since ventilation rates are likely to increase in some commercial, high performance buildings, interactions between these high ventilation rates and filter efficiency need to be thoroughly investigated so that the efficacy of high-efficiency filters in these situations are demonstrated. This study explores these interactions and how they impact indoor PM concentrations, through a series of experiments and simulation. For the ventilation rates, the outdoor air damper was operated at 15%, 30%, or 100% opened, which corresponded to measured ventilation air exchange rates of 1.2, 2.3, and 5.4 h-1, respectively. Experiments were run over 66 such days, with each day set at one of the nine different filtration-ventilation combinations, during both heating and cooling seasons. By dividing the return by the outdoor air PM measurements, the indoor-outdoor (I/O) ratio of the PM2.5 concentration was calculated for each filtration-ventilation combination. Since there were no indoor PM2.5 sources in the study office, the I/O ratio is useful to show the percentage of outdoor PM that infiltrated indoors. That is, an I/O ratio of 0.15 means that a filter allowed 15% of the outdoor PM into the indoor air. The I/O ratios were calculated every 6-minutes with all data over the entire 66 days are shown in Figure 1, which uses box plots to show all the data effectively at one time. On these plots, the median value (50th percentile) is the line in the middle of the box, the bottom and top of the box are the 25th and 75th percentiles, respectively, and the bottom and top whisker are about the 5th and 95th percentiles, respectively. At its most general, Figure 1 demonstrates that increased ventilation would cause an increase in the I/O ratio of PM2.5, but also that highly efficient MERV filters are largely capable of mitigating this increase. 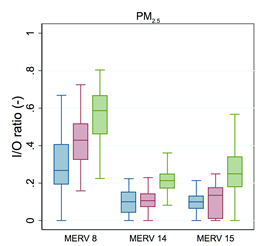 Notably, median values of the I/O ratio for MERV 14 and 15 filters at the highest ventilation rate were lower than the I/O ratio for the MERV 8 filter at the lowest ventilation rate. The synthetic MERV 14 and the glass MERV 15 filters performed similarly in our experiments. The measured PM data was also used to estimate the filter removal efficiency of each filter using a mass balance approach at each real-time measurement. 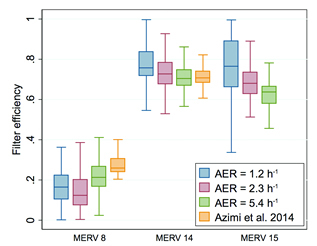 Again using box plots, the calculated filter efficiencies are shown in Figure 2 over all the data, as well as the MERV 8 and MERV 14 filter efficiencies estimated in the IAQ literature by Azimi et al. (2014)1, who estimated PM2.5 efficiencies using typical filter curves and measured PM outdoor distributions from around the world. The filter efficiency values for the MERV 14 and 15 filters were much higher than MERV 8 values. For instance, the median efficiencies for the MERV 8 filter ranged from about 0.15 to just over 0.2, while the MERV 14 and 15 removal efficiencies were similar to each, and median values were between 0.6 and 0.8, mostly near 0.7 on average. Both the MERV 8 and 14 measured filter efficiencies were quite near those estimated in the literature. Though this data is not shown, real-time filter efficiency had no significant correlation with outdoor air temperature or relative humidity. Also, filter efficiency was also shown to have a no observable effect on fan energy consumption or flows. In the modeling portion of this work, two medium-size offices (square footage of 4980 m2 or 53,600 ft2) offices, one with a constant air volume (CAV) system and one with a variable air volume system (VAV), were simulated annually using all combinations of nine ventilation rates (from 20 to 100 CFM per occ) and seven filter types from Azimi et al. (2014) (from MERV 8 to high-efficiency particulate air [HEPA] filter). The building models were based on prototype building models developed by the U.S. Department of Energy and enhanced by the Pacific Northwest National Laboratory and simulated in EnergyPlus. Simulations were conducted using 15 different weather files representing different ASHRAE/ICC climate regions in the United States. The outdoor PM concentrations were extrapolated from U.S. Environmental Protection Agency monitoring data and an indoor-outdoor mass balance model was used to estimate indoor air concentrations. A series of concentration-response (C-R) functions from the literature were used to estimate median annual health impact of exposure to indoor PM2.5 and ozone in the simulated offices. These health effects were monetized using different costs-per-incidence from the literature. The energy costs due to ventilation and filtration and the estimated health costs due to PM2.5 and ozone exposure were combined for each modeled case. Figure 3 shows costs for the CAV office in climate region 4A (New York City) for different filtration-ventilation combinations. While both energy and public health costs increased with ventilation, filtration had a much stronger effect on the overall cost, and filters with high efficiencies were able to effectively eliminate all PM2.5 related cost. The cost of filter purchasing and replacement was also taken into account and was shown to have a minimal effect on the overall cost compared to its public health cost reductions. 1. Azimi, P., Zhao, D. and Stephens, B. (2014) Estimates of HVAC filtration efficiency for fine and ultrafine particles of outdoor origin, Atmos. Environ., 98, 337–346.